Leon’s has a variety of financing options, including no interest, no payment plans (*O.A.C.). And you can also apply for a Two-In-One Leon’s Visa Desjardins card today. Go to leons.ca/financing to find out more. WHY BUY PAT I O FRO M All of our patio furniture you see on these pages have aluminum frames. What does that mean? The pieces are lightweight, making them easier to move than your typical outdoor chairs and tables. Plus, aluminum frames are rust-resistant, durable and long lasting. The better you take care of it (storing it in the winter, of course) the longer it will last. Don’t worry about running out of propane. All of our fire pits convert from propane to natural gas supply easily, and the conversion valve is included. But remember, have a qualified natural gas or service company install it properly and safely. TEMPERED GLASS NO-HASSLE DELIVERY There’s no grabbing a cart from the parking lot, finding the patio aisle, and loading your cart with boxes of patio furniture. Just order it – and we’ll deliver it! Leon’s offers free local delivery with minimum purchase from most locations. For more info, go to leons.ca/delivery. All tables have tempered glass tops, which are treated to be stronger, safer and much more durable than regular glass. Looking for a deal for your patio? 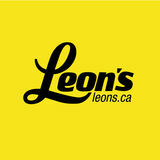 Pop by your local Leon’s or visit leons.ca to find out about our latest sale. Plus, get the inside scoop first on our sale announcements on Facebook, Instagram and Twitter @leonsfurniture. The pillows and cushions are all made with UV/fade-resistant fabric, and are mould-, mildew- and water-resistant. And it’s easy to take care of – it just takes a bit of vacuuming or light brushing to remove any dirt or grime. we l c o me There’s nothing like a breath of spring air to make you feel refreshed and alive. At Leon’s, we believe the same is true for your home. As winter draws to a close, most of us are eager to soak up the sun. And what better place than your own private outdoor retreat. Imagine greeting each day quietly sipping your coffee. Or having family and friends over for a Saturday night taco party in your backyard social space. 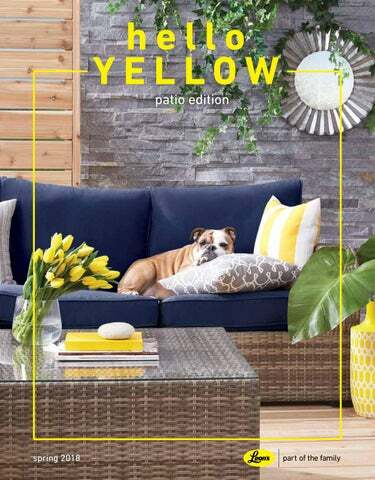 This issue of Hello Yellow looks at the furniture and accessories you’ll need to set up your patio, porch or balcony paradise – for every style and budget. Enjoy! SPRING REFRESH Update your patio with our colourful accessories. BUYER’S GUIDE What to look for when shopping for a sectional. ENTERTAINING Dine alfresco with roomy banquette seating. OUTDOOR LIVING Design a farmhousechic outdoor family room. HOW-TO Set up an inviting patio chat area. CHILL OUT Create a resort escape in your own backyard. STYLE TIP Outdoor rugs define your space and help to create a polished, outdoor-room aesthetic. Place one under your conversation set or dining table. DESIGN LESSON Interior designers love ceramic drum stools. They fit even the smallest space, doubling as side tables and extra seating. Sofa sectionals are versatile space-savers. A movable ottoman provides even more layout options. Long-lasting resin wicker is weather-resistant and maintains its natural look for many years, when taken care of properly. Opt for next-gen outdoor fabrics. This easy-care charcoal linen is crafted from a fade-resistant synthetic material. A glass surface makes it a breeze to maintain a crumb- and spill-free table scape. And because it’s tempered glass, it’s also a safer option, too. The powder-coated aluminum frame withstands years of outdoor exposure while still maintaining its natural look. DESIGN LESSON This table does double duty as both a dining area and a lounging spot to have drinks, or read magazines. Plus, you have storage below for throws, candles and more. ENTERTAINING SPICE IT UP Welcome guests with a fun cocktail that complements the menu. Our Watermelon-Jalapeno Margarita is perfect for hot summer nights! Go to leons.ca/outdoor for the mouthwatering recipe. MAKE ANY NIGHT TACO NIGHT Nothing says summer more than a build-your-own taco table. This durable resin wicker and polywood banquette set seats up to seven in comfort. Dress up the classic blue cushions with brightly coloured pillows to match your Mexican-themed night. And keep the fare simple and fun with family-style platters and a pitcher filled with thirst-quenching lemonade. OlĂŠ! Today’s compact, high-quality dinette sets fit even the most petite high-rise balconies. Low-maintenance materials like aluminum frames and woven resin stand up to the elements and require little more than the occasional wipe-down to keep their good looks. Read on for more options to suit every size of urban space. YOUR SPACE. YOUR PERFECT MATCH. STYLE TIP For an Instagrammable farmhouse vibe, accessorize with potted herbs and quirky planters. Eat, play and hang out. This woven-resin wicker sectional features smart design elements like toddler-friendly rounded corners, and space-saving ottomans that tuck away under the coffee table. The stain-resistant upholstery comes in modern neutrals like navy or grey, and will stand up to years of summer fun. BIG-SCREEN VIEWING This is your space, so make it family-centric. A sectional allows for relaxed movie viewing as well as intense game nights thanks to the casual seating! sectional and soft indoor/outdoor rug for low-maintenance style. Set the kids up with a flick, while adults converge nearby for wine and conversation in a relaxing fireside lounge area. GET MORE FROM YOUR OUTDOOR SPACE A fireside lounge brings next-level R&R to any yard. Relaxed rocker seating provides a comfy spot for adults to enjoy. Best of all, a fire pit is a sound investment â&#x20AC;&#x201C; its warming effect allows you to extend your outdoor season into mid-spring nights and crisp autumn evenings. As for nights with the family, roasting marshmallows over an open flame can be your new summer tradition. coastal LIVING ENJOY REFINED NAUTICAL STYLE IN YOUR BACKYARD – NO OCEAN VIEWS REQUIRED! Coastal design is a timeless look that never goes out of style. Think crisp navy and white, woven rattan in shades of sand and stone, and nautical-inspired accessories that reinforce the waterside theme. It’s a versatile look that works whether you live by the sea or in the heart of the city. DESIGN LESSON Sectionals make great use of corners and let you carve out an intimate conversation area within a larger outdoor space. STYLE TIP Add life to your sunroom or porch with bright pillows and tall plants. TRAY CHIC Up your entertaining game with a rustic vibe. This glass bike wheel tray doesnâ&#x20AC;&#x2122;t shy away from the texture of your wicker table. INDOORS OR OUT Create a casual conversation spot with a beautiful porch set. Choose low-maintenance pieces that look great and stand up to the elements (even covered porches are subject to temperature flux and humidity). FURNITURE PLACEMENT Create a warm, intimate setting by placing seats closely together. The main focal point is the company at the table. COLOUR PALETTE Punch up neutral furniture with eye-catching, summer-bright hues. Playful prints give an outdoor room a casual, fun and inviting feel. ACCESSORIES A casual space is all about no-fuss comfort. Toss a cheerful rug underfoot and lounge away with snacks and stacks of magazines. FURNITURE PLACEMENT A modern outdoor arrangement showcases a focal point such as a lush garden. Seats should have unobstructed sightlines, with the widest piece, such as the sofa, facing it directly. COLOUR PALETTE Stick to neutrals for an upscale, classic look. Cream and charcoal accessories are a natural complement to this tan and brown set. A jolt of yellow adds zest. Create your own private outdoor retreat with Leon's new 2018 Patio Collection.